A former president of the South African chapter of the International Association of Women Judges, Allie has served on the Western Cape Bench since January 1 2004. In one of her more high profile cases, Allie dismissed, with costs, an application by Inkatha Freedom Party member of parliament, Mario Oriani-Ambrosini, to declare as unconstitutional any national parliament rules that prevented the introduction of Private Members Bills by MPs. This was overturned by the Constitutional Court inOriani-Ambrosini v Sisulu, Speaker of the National Assembly, when the majority found that several of the impugned rules, and words in other rules, were inconsistent with the Constitution, and ordered that they be severed. Allie has demonstrated a mindfulness for the social and psychological factors that contribute to offenders’ crimes when sentencing, or reviewing sentences. In one instance, when setting aside a magistrate’s court’s 15-year sentence for a 15 year-old boy found guilty of murder, Allie wrote, “the Court has to [temper] its sentence by taking account of the personal circumstances of the accused, and in this matter the appellant was clearly a youthful offender from a very troubled and disturbingly unstable domestic background,” reasoned Allie. In 1984, she obtained a B.Proc from the University of Cape Town where she was active in student politics and was a member of the Azanian Students Organisation and the United Democratic Front. Allie worked as a candidate attorney from 1985 to 1987, when she was admitted as a practising attorney. From 1988 to 2003 she worked at R Allie & Associates as a private legal practitioner. At first, the signs were curious: Chief Justice Mogoeng Mogoeng’s chair was empty as the interviews for the position of Western Cape Deputy Judge President were about to start on Wednesday evening. They then became ominous when Supreme Court of Appeal president Lex Mpati announced he would be chairing the sitting in place of Mogoeng who had, in his “wisdom”, recused himself because of text correspondence between “one of the candidates and another person”. Heads were scratched. Minds raced. 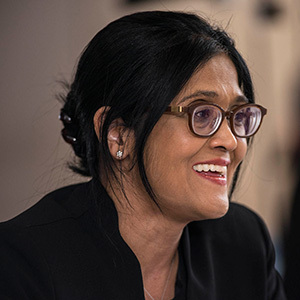 Judge Allie batted away the usual opening questions about experience on the Bench; deficiencies in the division and remedies to make it more efficient; obstacles to the gender and race transformation of the Cape Bar and the judiciary, and how she envisaged filling the role of deputy judge president. Then Northern Cape Judge President Frans Kgomo dropped the hammer: Ziyad Motala, professor of law at Howard University in Washington DC, had sent the Judicial Service Commission a copy of WhatsApp and email correspondence between Allie and himself. The conversation occurred in February 2014, when Mogoeng had circulated a draft document prescribing norms and standard for judges, including six hour days in court and tighter deadlines for handing down judgments. There had been criticism of the document, including a letter sent by the judges of the Western Cape Bench raising concerns that the new rules infringed on their independence as judges and treated them like “civil servants”. Allie admitted to the commission that she was the “primary drafter” of the letter — one of those unhappy judges. In fact, in the privacy of WhatsApp, she appeared spitting mad, raining down a shower of invective at fellow judges involved in drawing up the document and the head of the judiciary itself in her midnight messages to Motala. Mogoeng was accused of “fruitless and wasteful expenditure” as he travelled the world with an “undemocratically elected” group of judges researching best practice models to make the judiciary more effective. This he did, Allie had claimed, with “eight bodyguards” and ER24 emergency personal on constant standby “in case any one of us has a headache”. Allie protested to the commission that she was demanding consistency about curtailing expenditure and questioned the need to visit other countries for best practise models when there were enough here. Allie had earlier “unreservedly apologised to anyone offended by the WhatsApp” messages. She told the commission she had asked Motala not to go to the media with the correspondence and described his submitting it to the commission as an “unconscionable breach of trust between two friends”. The admittedly ill-tempered comments, Allie said, were made during “a heated and robust exchange” during the “sloppiness” of instant messaging and a late night. Kgomo read further, as Allie described a “sick roadshow by an individual with no conviction or insight” and asked: “Who is this individual?” Allie said it was a reference to Motala — who had claimed the project as his own, she said — and not Mogoeng. Few believed her. “The person you are referring to here is the Chief Justice,” Kgomo said. Kgomo read out other parts of the tirade: former justice minister, the late Dullah Omar, “was known for his cronyism”, Allie’s fellow Western Cape Judge, Nathan Erasmus was described as an “apartheid apparatchik” and appellate court judge Stevan Majiedt “had compromised his independence for his personal gain”. In another message, read out by commissioner CP Fourie, Allie had intimated she wouldn’t be taking the new recommendations sitting down since she was no “armchair strategist”: “I am going for the jugular,” she declared, presumably referring to the chief justice’s neck. Fourie said his impression was that Allie appeared to regret that her messages “made it into the public domain” but did not regret the content. Motala, Fourie said, referred the exchange to the commission to demonstrate that Allie didn’t have the “gravitas, maturity and temperament” to be the deputy judge president of the Wetsren Cape. Economic Freedom Fighters MP Julius Malema accused her of acting without honour and said she “should have withdrawn from this” interview. Allie did not. It was a compelling, brutal, ugly, viewing.